This episode was my very first and, as they say, you never forget your first… Well, I certainly won’t forget this episode! It was all extremely exciting and rather terrifying. Not only did I have to film for the Deutsche Welle for the first time but also for a documentary that the Berlin Philharmonic´s Digital Concert Hall was making about the day. Oh, AND I had to play the horn in Carmina Burana too… so it was a packed day and a very tiring shoot – but we started with a bang! The very first piece-to-camera was up on the balcony of the Philharmonie overlooking the Kulturforum, where Carmina was being staged. I remember being quite ok about everything until I got onto that balcony and had to say my first texts with the whole crew looking at me. The nerves kicked in! But everything went well and it was a great day. Perfect music to start Sarah´s Music with, by the way – Carmina Burana by Carl Orff sung by the Berlin Radio Choir accompanied by children who we called our ‘Vocal Heroes’. I was very grateful to my ‘Boss’, Sir Simon Rattle, for being my very first interviewee on Sarah´s Music. What a way to start…! 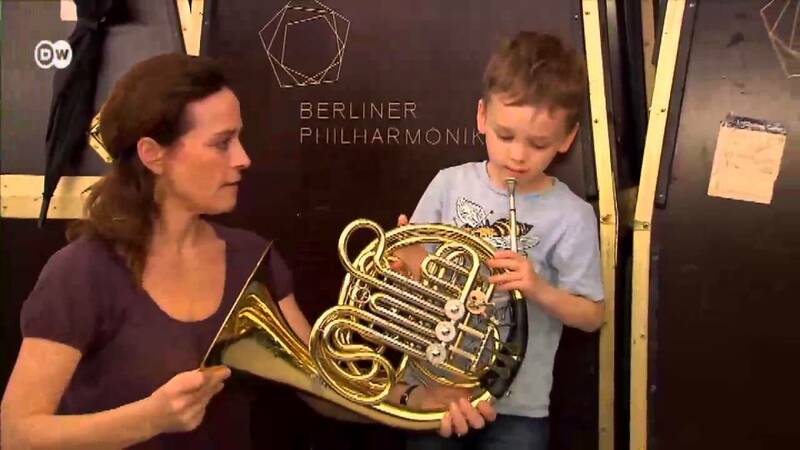 Simon Halsey was also wonderful to talk to and the Sarah´s Music Horn Challenge was started in style by young Clemens (who now watches every programme and compares the Horn Challenges to his own)..
Has she learned her script? Thumbs Up for the Vocal Heroes! The very first Sarah's Music Challenge!